Julie M: Clearing the decks from 2012, we found a few movies we watched but never discussed. We’ll take them in logical groups…starting with this one, in which we compare two older movies and a more recent one, where women refuse to give up on their guys. Jenny K: Oooh, I feel all Tammy Wynette…got to preserve my objectivity…so, the question is, do the men deserve it? Usually not. 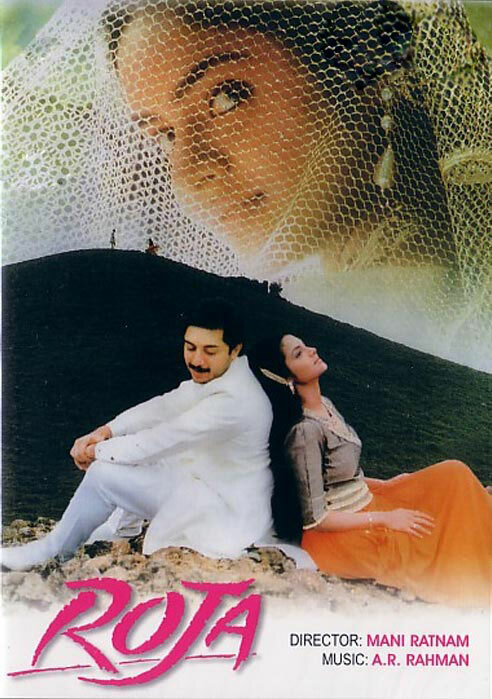 Julie M: Roja (Madhoo) is a naive and sheltered village girl, given to play and girlish plotting to marry off her older sister Lakshmi (Vaishnavi) to the eligible city bachelor Rishi (Arvind Swamy) who has come a’courting. But the best-laid plans go wrong… Lakshmi confesses her love for another, and to save her family’s honor Rishi pretends that she rejected him and proposes instead to Roja. Within a day she is married and must learn to live with this stranger and his mother in the big city. Just as they have gotten used to each other and shyness is turning to love—i.e., in about a week–Rishi is sent to Kashmir on a secret government mission and takes Roja along. Unexpectedly, and before her very eyes, he is kidnapped by terrorists (aka Kashmiri freedom fighters), who want to use him as a hostage against the release of their brutal and imprisoned leader. The government’s policy of “no giving in to terrorists” is unacceptable to Roja, and she begins a campaign of pestering, weeping and going over everyone’s head to try and get them to effect the exchange. Will Roja ever see her beloved husband again? Will the terrorists kill Rishi if their demands aren’t met? I really enjoyed the fact that the whole “terrorist” definition was blurred. This scene was a bit disturbing, though. Jenny K: This was the first movie I saw Pankaj Kapur in (Liquat). He’s a given for any director who needs a multi-layered interpretation. Julie M: Mani Ratnam direction, lush scenery both in Tamil Nadu and Kashmir, heart-thrilling music by AR Rahman before he became superfamous, and one absolutely superior song. But I prefer the Tamil version. Romance, drama, politics…everything one could want! After so many modern-kid romances it’s nice to see something with old-timey values, nationalism and a female star who isn’t size 0 and/or nipped and tucked beyond recognition (sorry Genelia, Priyanka and Deepika). Enjoyed it very much although I thought at first I wouldn’t, and I think I’d like the undubbed Tamil version better because of the language. Thanks for the recommend! It’s available free on YouTube, subtitled, in 13 parts. Here is Part One. Jenny K: I’d give odds that Rahman writes the music with the Tamil lyrics in his head. They always “sound” better, if you know what I mean. Not that I understand either well enough to really judge, but…I’m glad you liked Roja! Early Mani Ratnam films are particularly nice. They, literally, don’t make ’em like that any more. Julie M: Even though the title was her name, they gave approximately equal screen time to the kidnapped Rishi and Roja’s efforts to get him back. Julie M: Old love stories are the best, aren’t they? 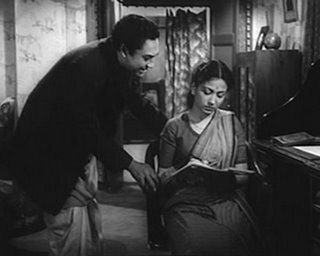 I watched the Bimal Roy film Parineeta (The Fiancee, 1953) over the past few days, and somehow, even though it was from 1953, it felt fresh. And this was my first extended experience with the luminous Meena Kumari and the fabulous screen chemistry she had with Ashok Kumar. Jenny K: Didn’t I lend you Sahib Bibi Aur Ghulam, yet? Guru Dutt directed her in one of her most iconic roles! Lots of undeserved female devotion in this film, too. It would fit right into this week’s theme, but, no spoilers! Definitely in the next shipment, you’ll love her in that one. It’s on Youtube for free, but the captions are really odd. 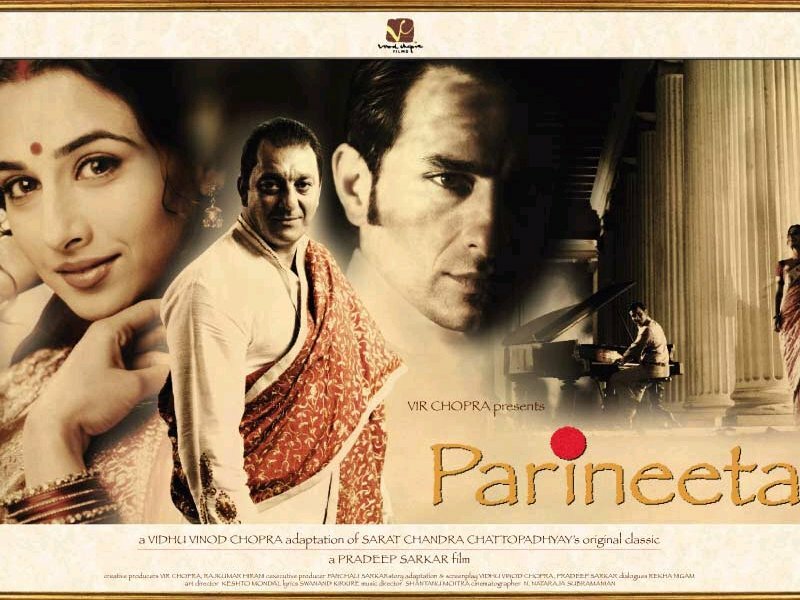 Julie M: In Parineeta, Lalita (Meena Kumari) is an orphan living with her uncle and his large family of all daughters. The middle-class family has recently fallen on hard times, her uncle having mortgaged all he had in order to marry off his eldest daughter and now unable to pay back the loan. The loan is held by his wealthy next-door-neighbor, a professional moneylender, whose family is longtime friends with Lalita’s uncle’s brood. The moneylender secretly does not want the loan repaid, as he wants to collect on the house and give it to his recently returned son Shekhar (Ashok Kumar), who is of marriageable age (as is Lalita). Lalita and Shekhar’s neighbor-friendship turns to love and a secret promise to marry. Here’s a clip of the moment just after Shekhar playfully places the bridal garland around her neck; ironically, her little cousin is at the same time commanding all to participate in a mock bridal ceremony for her dolls. Jenny K: Wow! The lyrics to that song sort of sum up Lalita’s entire outlook on love and marriage, don’t they? In the novella the movie is based on, by Sharat Chandra Chattopadhyay, that little girl would have been a more likely Lalita than Meena. The girl in the story was thirteen, whereas both Shekhar and Giren/Girish were schoolmates, both 24. So when Shekhar drops the garland playfully around Lalita’s neck and then kissed her, would it be unreasonable for her to think she was married? This was written in the early twentieth century when child marriage was still legal in India. Julie M: Oooh, good point. Not having read the novella I didn’t know that. It did seem awfully weird that Lalita would assume that she was already married when even Shekhar didn’t think that. Jenny K: Knowing that adds much more sense to the story than any of the adult behavior in these movies, yours and the 2005 version that I rewatched recently, starring Saif Ali Khan, Vidya Balan and Sanjay Dutt. Even given its shift to the 1960’s, the plots are very similar. Please continue. Julie M: Just then another handsome and wealthy–but lower-caste–young man, Giren (Asit Baran), enters the picture. Giren falls in love with Lalita and offers to give Lalita’s uncle the money he needs to pay off his debt, then when Shekhar’s father becomes enraged at his plans being thwarted and cuts off contact, offers to move the entire family to one of his homes far away. Lalita’s uncle is grateful and half-promises Lalita to Giren in marriage. Lalita feels she cannot refuse, and Shekhar picks a fight with her, saying she has allowed herself to be sold. After they have left his marriage to another girl is fixed by his family while he pines for Lalita, realizing that his own actions have driven her away but seemingly helpless to do anything about it. Jenny K: In the 2005 version, Lalita (Vidya) helps to confuse the matter by nobly/idiotically keeping most of her family turmoil away from sensitive musician Shekhar’s (Saif’s) tender ears. She thought he wouldn’t be able to stand it if he found out what a louse his father was. Seems Daddy Dear had hatched this major plot to turn the neighbor’s immense if neglected haveli into a “Heritage Hotel” when he foreclosed on the unsuspecting family. Ignorance of her motives, plus confusion over her marital state, makes Shekhar’s mistakes more forgivable… if still stupid. And it does give them an excuse for a wonderfully poignant love song in the latter half of the film. Julie M: Will family honor and gratitude win out over true love? Will Lalita ever stand up for herself? Will Shekhar finally grow a pair and claim his original bride? You pretty much know the answer (no, not really and yes but not in the way you think) but how it plays out is heartfelt. Giren is a real stand-up guy and under normal circumstances Lalita would have been perfectly happy to end up with him, and why she holds out for the volatile and coddled Maa’s-boy Shekhar is beyond me. Still, if you buy into the entire premise it’s a fascinating movie and provides a good look into Indian culture and values. Jenny K: Guess we’re just looking at things through today’s eyes, but am I wrong, or isn’t the ever-hesitating rich boy lover a staple in Bengali literature and film…can we say Devdas (same author)? Julie M: You know, the entire time I kept thinking Devdas but thought I was crazy. Thank you for confirming my mania. Jenny K: And Rabindranath Tagore was full of stories of unappreciated, lonely wives/widows as in Choker Bali, put on film in a faithful if plodding version by Rituparno Ghosh starring Aishwarya Rai. And how’bout Paroma by Aparna Sen! The beautiful melancholy must seep into the Bengali blood along with the humidity of the Hooghly River. Comparing Roja and Parineeta is fairly obvious. Both of them have heroines who refuse to give up on their men, believing that they will come back to them. Things don’t seem to have changed in India in the 40 years between these movies…women are given in marriage against their will, strangers fall in love, and so forth. Financial difficulties in 1953 turn into terrorist threats in 1992, and Roja is more active in removing the obstacles between her and her true love while Lalita seems content to just wait things out, confident that eventually her love will return to her. So I guess there has been some progress after all. Jenny K: Well, I’d hope so, but professional victimization always seems to come back in fashion, even in today’s supposedly more modern times. In my own life, I’ve seen too many women believe the fiction handed down to them that they can’t cope without a man. Thank God for Bryn Mawr, and my parents, of course…that I was slower to feel that pressure, but you always have to keep telling yourself and your daughters that, to keep it fresh and in the forefront. Poor little orphan Lalita didn’t have much of a chance to change her fate, and she just lucked into a happy ending at the last minute. She had a better option with Sanjay’s Girish, but was already “wedded” to her choice by then. Hope it worked out for her after the final reel. But with all the inherent flaws of literary adaptation, I did like Saif and Vidya’s version. It’s a lovely period piece, with great warm shots of Kolkata. Plus the acting is uniformly good. It was Vidya’s first film, and she more than held her own with Saif and Sanjay. Sanju’s part was smallish, but his Girish is a lovely guy and is quite endearing in this, particularly at the “meet cute” as the supposed electrician. And, though I have been notably tough on Saif Ali Khan in his attempts at assaying a romantic role, in this one he does very well. Perhaps I just like him more in an angry role than as a callow youth or a funny Romeo. Julie M: In the 1953 version I’m not sure she really “lucked” into anything. She seemed to have a bit more agency than luck—in fact, there’s a very Roja-anticipatory scene at the end. Spoiler alert: Lalita actually refused Giren so he marries her sister/cousin. We find that out at the same time that Shekhar does, and it’s a delicious twist that almost makes the whole film. (end spoiler) I tend to agree with you on Saif; his romantic roles are best when he’s not set up as the romantic hero but cast as the Giren-ish character. Jenny K: Or in an all out villain role like the Iago role in Omkara…a Saif tour de force! Ending on a non-sequitur…Version 2005 has an item number with Rekha in it, onstage at the Moulin Rouge (seems it’s a multi-city franchise), that still irritates me, eight years after I saw it in the theater. Another uncredited musical lift…this one from Louis Armstrong’s “A Kiss to Build a Dream On.” Why this is still happening? Use it if you like, but why not credit it? Shame on you, Shantanu Moitra. Thanks ladies for these always pleasant comments of yours – I do like the way you write/chatter! And I chime in for Roja, which I was pleased to jump back into, so full of charm it is! The perfect combination of romance, action and involvement! It is true, you know what you say about those early Mani Ratnam movies. Roja was shot in 1992, twenty years ago! And, er… I don’t feel like you need to extend any apologies to the likes of Genelia & Priyanka! BTW, watch out you don’t catch the “old is gold” bug!!! (well, I’m down with it, and I survive). Thanks, Yves! Hope you like the next one, even if it is a little fangirly. Great to have you back, Yves! We’ve been a bit sluggish in our posting, probably due to the winter, but also due to lack of opposition, as they say. We love good conversation, even if it’s not as complimentary as your post was. Thanks for the thumbs up! I saw your first two tries at the post, they were stuck in my spam queue, but I have no idea why they went there. I didn’t see much difference between them. Go figure…sometimes WordPress is awfully inscrutable. I think Ashok Kumar is handsome and can be an attractive catch, but I didn’t like him at all as this self-centered, controlling Shekhar and, at the end of the movie, I thought Lalita would have been better off with Giren who I thought was a wonderful fellow. Goes to show, sometimes girls are obsessed with the wrong men. That seems to be the standard trope in films…I guess picking the “nice guy” just isn’t cinematic enough. Even Paro in Devdas, who took the correct line in not waiting for her immature beau to grow up wasn’t rewarded for going with her rich husband. He didn’t love her either, and she ended up regretting her choice in the end…both suffering in staying with her husband, and suffering doubly by having to watch Devdas die outside her gate. No winners in this scenario, but lots of drama!